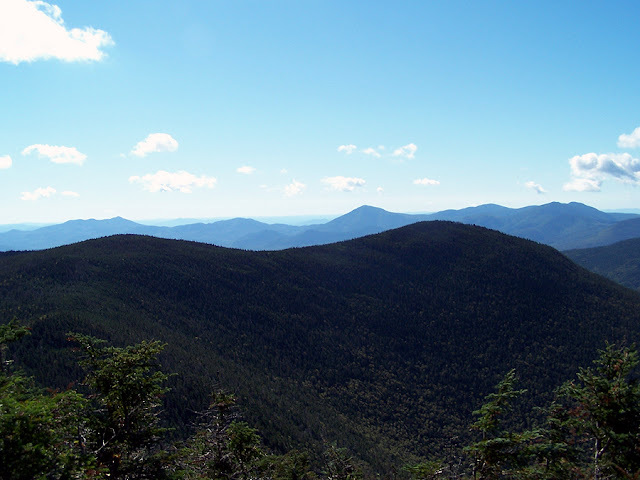 Mount Hancock and South Hancock are located just outside the boundry of the Pemigewasset Wilderness. The Hancock loop trail goes over both peaks and is very steep and has rough footing the half mile or so going up to each peak from the Hancock Loop Trail Split. There are no other trails that take you up the Hancocks but there is the "Arrow Slide" which is a steep open slide that is another way up to North Hancock. There are two outlooks near each summit that have decent views and usually there are Gray Jays at the summit which will eat trail mix right out of your hand! - Hancock Notch Trail/Cedar Brook Trail/Hancock Loop Trail: 4.9 miles, 2,650 elevation gain. The Hancock Notch Trailhead is located at the "Hair Pin" turn on the Kancamagus Highway. The Hancock Notch Trail to the Cedar Brook Trail has good footing and very easy grades. The Cedar Brook Trail has moderate grades and decent footing. There are several brook crossings on the Cedar Brook Trail that can be annoying when the water is running high, not dangerous but you're going to get your boots wet. The Hancock Loop trail has moderate grades until the trail junction split where you can go left for Hancock or right for South Hancock. From here the trail ascends rapidly over the next .5 miles with footing that is poor at best with exposed roots and loose rocks. Between summits the footing is better and the trail is pretty easy-going.